Sometimes doing this whole blogging thing certainly has its perks. I love interacting with readers, getting feedback from people who try my recipes, and being known for doing something other than dentistry. But then there are the more tangible perks. Like when the German cookie company Bahlsen offered to send me some cookies and a Tiffany’s cake plate so I could enter a cake-making contest in honor of their 125th birthday. So here we are, with plenty of fancy German cookies, a super fancy cake plate, and a celebration for 125 years of delicious cookies. 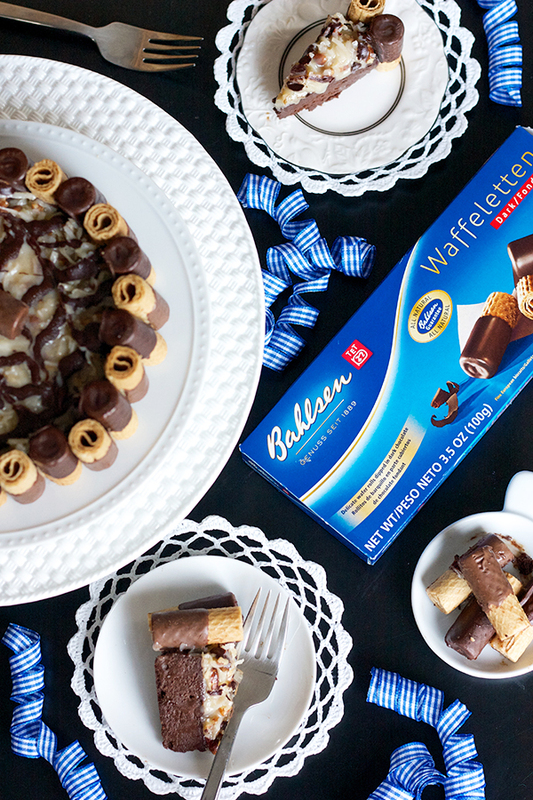 I’ve always wanted to make a cake lined with pirouette cookies or the like, so the minute I received my Waffeletten cookies I knew that’s how my birthday cake would start. Then I took things really literally by topping a to-die-for flourless chocolate torte with the sweet coconut filling found in “German” chocolate cake. It’s chocolatey, it’s elegant, it’s German, and it’s actually really easy to make too! 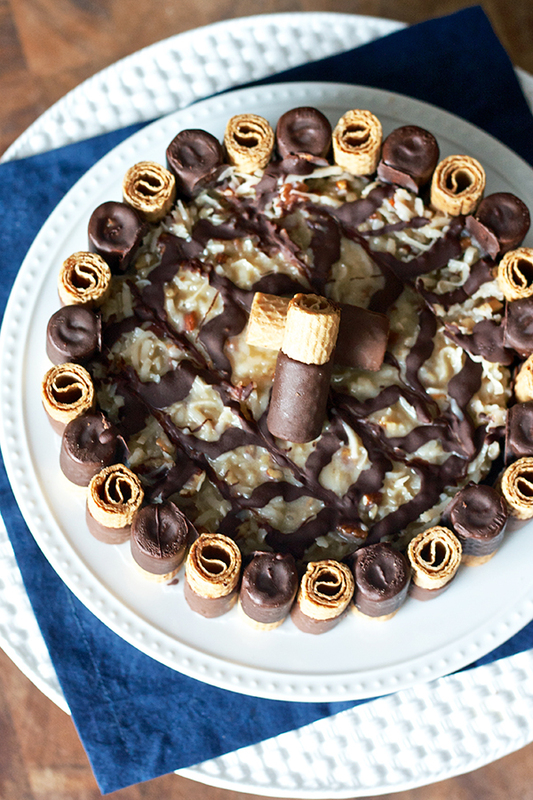 Bahlsen challenged me and 15 other bloggers to make a cake featuring their rolled Waffeletten waffle cookies to “Let the Good Times Roll” for their birthday coming up next week. Get it – rolled cookies/good times rolling?? The Germans have always been known for their humor :) For this contest, they’re looking for an easy-to-make, creative, attractive, and delicious cake. I can certainly say this is an easy one – the flourless cake comes together with just 6 ingredients I’m sure you already have on hand and the topping is a one-pot endeavor. Adding the circle of Waffeletten cookies around the circumference instantly adds elegance and a hearty crunch to each piece. And the taste? OMGGGG. Ryan rarely goes out of his way to exclaim over my creations (he sadly doesn’t have much of a sweet tooth), but he was seriously addicted to this cake. I had to physically remove the cake from our apartment before we both developed Type II diabetes overnight. 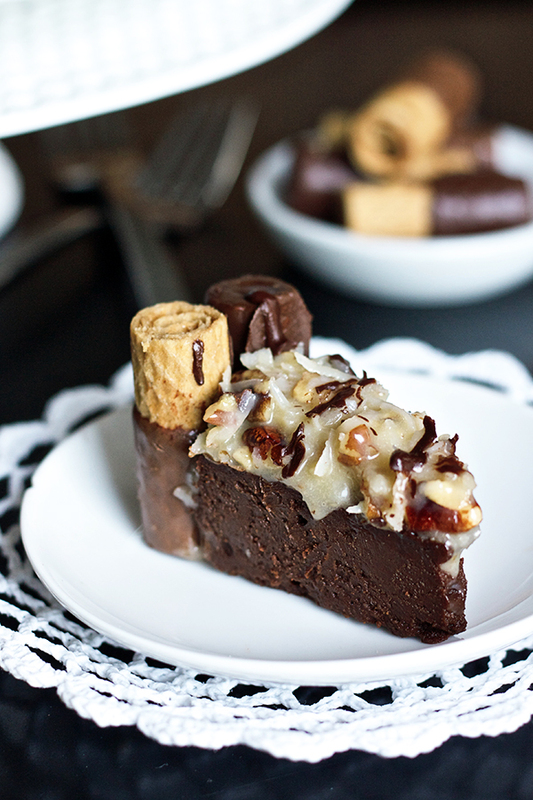 The chocolate torte is super rich and decadent thanks to the absence of flour, and it goes so, so well with the sweet and nutty coconut/pecan topping. Finished off with the crisp of the Waffeletten cookie, it’s pure German chocolate perfection! Can we just take a moment to appreciate how cute these cookies are all lined up in the photo below? Doesn’t matter what’s inside that ring of cookies, you know it’s going to be good. Of course what I’ve put inside makes it out of this world, but I can’t decide if I like the taste or the look of these cookies better. I’m the kind of person that stacks chips on top of each other before eating them to ensure extra crunchiness, so the built-in layers of these cookies are so ideal for me. They aren’t overly sweet, but the chocolate adds just the right amount of richness. Bahlsen makes dark chocolate and milk chocolate varieties and I alternated them on the cake for a fun decoration – dark chocolate standing up straight and milk chocolate on their heads. Two boxes of cookies made for the perfect amount of lining the 6″ torte with a few leftover to top for decoration and a few to go straight in my tummy. 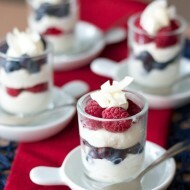 I just love the look of them, especially perched on top such a nice cake plate. I’m really hoping this cake is easy, pretty, and tasty enough to win the contest – the grand prize is a 3-day workshop of our choice at one of the legendary Le Cordon Bleu’s Bleu Ribbon Kitchen locations. I would LOVE that!! But even if I don’t win, I’m still pretty crazy about my new cake plate and that I got to try these new-to-me German cookies. I’m definitely going to have to order these online if I can’t find them in the city because those two boxes went way too quickly! 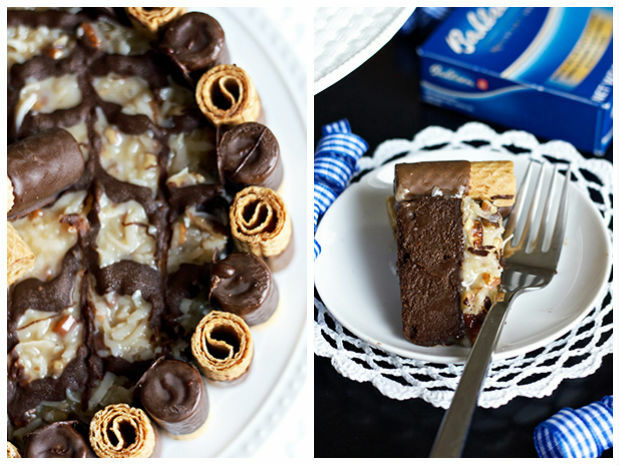 Here’s the recipe for this amazing dessert, please make it if you love the flavors of German chocolate cake, and keep your fingers crossed for me too :) Thank you Bahlsen for the chance to enter this contest and all the great goodies – happy 125th birthday!! Preheat the oven to 300 degrees F and grease one 6" cake pan with non-stick spray and set aside. In a small saucepan over medium heat, combine the water, salt, and sugar and stir until completely dissolved. Melt the semisweet chocolate in the microwave in 30 second intervals, stirring well in between each interval, until completely smooth. Pour the chocolate into the bowl of an electric mixer. With the mixer on medium speed, start adding the pieces of butter to the chocolate until smooth. Then add the sugar-water. Reduce the speed to slow and beat in the eggs one at a time. Continue beating until smooth. Pour the batter into the prepared pan and place cake pan inside a large pan. Then make a water bath by filling up the outer pan with boiling water until it reaches up to half the sides of the inner pan. Bake for 45 minutes, the cake will still appear wet. Chill cake overnight and only after it's chilled, invert onto a serving plate. In a medium saucepan, combine the sugar, evaporated milk, butter, and egg yolk over low heat. Stir constantly until thickened. Remove from heat and stir in the coconut, pecans, and vanilla. Chill in the fridge for about 2 hours to allow the mixture to thicken. Plate chocolate torte on serving plate or cake stand and spread German chocolate filling on the top of it in an even layer. 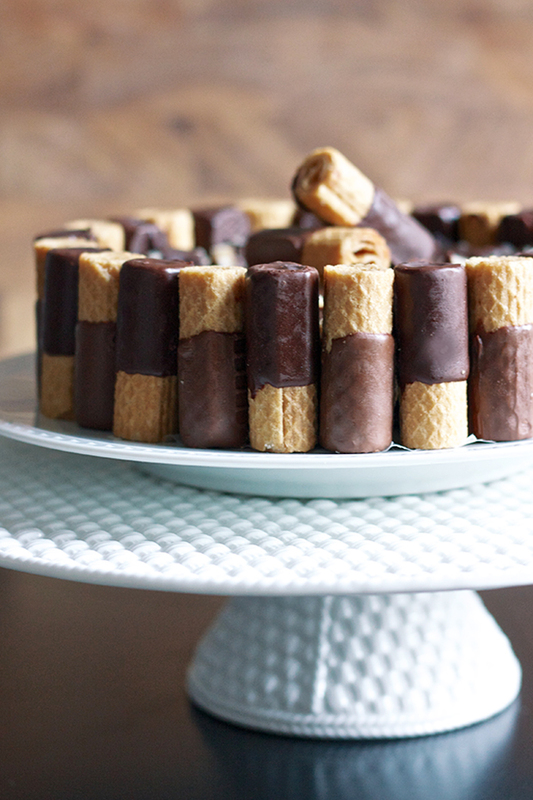 Line the outside of the torte with the Waffeletten cookies, alternating each one up and down. Melt the chocolate in the microwave, then transfer to a piping bag or ziploc bag with the corner snipped off and pipe lines of chocolate on top of the coconut filling. Then use a toothpick to drag through the chocolate perpendicular to make a nice pattern. Top with a few extra cookies and store in the fridge until ready to serve. Disclosure: I was supplied the Waffeletten cookies and Tiffany cake plate free of charge for entry into the contest by Bahlsen North America, but no other compensation was received and all opinions are my own. 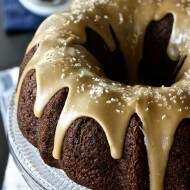 This cake looks amazing and so moist! What a great way to celebrate a birthday! Whaaaat! This is so beautiful. I bet Bahlsen is very very proud. This torte is gorgeous! Good luck, I hope you win! This cake looks great! I LOVE that you were selected to do this–that’s fantastic! Yet another reason why I love your blog, Erica. This cake is gorgeous and the folks at Bahlsen certainly know what they’re doing. Great cake–definitely sharing! Dies ist eine schöne Torte. Viel Erfolg ! Ich hoffe, Sie gewinnen! Erica! Name twin! This cake looks soooo flippin’ good! 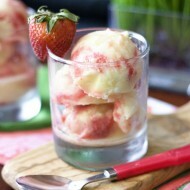 Absolutely pinning and making this! OMG this looks like moist fudge! I wish I had this for my birthday!